When traveling to Cape Town, most tourists – both international and local – spend most of their visit in the city centre, perhaps venturing out for a trip to the winelands or peninsula. There’s so much to do and see in the Mother City that you need to be selective about how to best spend your time here. That said, if you’re enjoying a longer stay or want to experience the not-so-touristy side of Cape Town, then Milnerton and Blouberg are worth a visit. Situated just north of the city centre, these suburbs offer beautiful views, water sports, and a taste of the laid-back beach life. You’ll also be able to snap your own photo of the iconic Table Mountain from one of the best viewpoints in town. If you’re doing a Saturday or Sunday trip to these areas, then the Milnerton Flea Market should be your first stop. Nestled against the train-tracks that wind up the west coast, this is the most unpretentious market in town, and a truly local experience. It’s predominantly bric-a-brac and second-hand goodies, so be prepared to dig through yesteryear’s odds-and-ends. However, there are also lots of interesting vintage pieces: diving helmets, antique teaspoons, army surplus, cast iron pots, and forgotten tomes. If you’re the kind of person who loves to wander through second-hand markets just to look at all the strange and wonderful things people used to own, this one’s for you. Milnerton’s beautiful lagoon is probably the highlight of this area. Go for a walk along the scenic palm-studded banks. It’s also a great spot for bird-watching, so ornithologists should bring their binoculars. Golf masters can tee off at the picturesque Milnerton Golf Club. Play 10 or 18 holes while breathing in that fresh ocean air, then pop into the beach-side clubhouse for a cold beer. Right next to the 18th hole sits the Milnerton Lighthouse. The 21m tower was built in the 1960s, so it’s not the oldest lighthouse in Cape Town. Lastly, the Rietvlei Reserve is situated between Milnerton and Blouberg. A nature-lover’s paradise, this massive wetland reserve ranges from reed beds to a freshwater lake and coastal dunes, and features an abundance of birdlife (including flamingos!) and other creatures for your appreciation. share of action. You can also reach it from the beach, so no need to play a round of golf just to get there. Just up the coast from Milnerton is Blouberg, also known as Blaauwberg – both names mean ‘blue mountain’. With its own ‘small town feel’, you could almost forget that you’re a short drive from the bustling city centre. 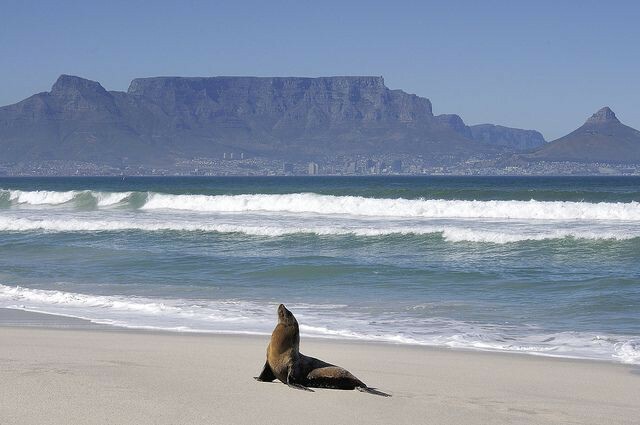 It’s also known as Bloubergstrand, and the ‘strand’ – or ‘beach’ – is the key feature. With Table Mountain as its backdrop, the long stretches of white sand provide the perfect photo opportunity for your holiday album. The sunsets are spectacular, so grab a sundowner at one of the many restaurants at the water’s edge. Water sports are the other big attraction here. Surfing, windsurfing, and kitesurfing are the most popular activities, but be warned that the wind can pick up quickly and become very unpleasant. Experienced scuba divers can explore the MV Seli 1 wreck just off the coast, but only in the summer months. Contact us for more information, or to book an activity during your stay. If you’ll be travelling this far out of the city centre, make a day of it – or at least an extended morning or afternoon. Most of the spots mentioned above are accessible with the MyCiTi bus system, but be sure to check bus times (they run less frequently and stop earlier over weekends). If you’re taking the bus from Parker Cottage, also be prepared to change lines at the main station in town, and know that it’s going to be a long ride – about 45 to 60 minutes. Alternatively, catch a taxi there or back, or both. It’s about a 20 – 30 minute drive, depending on where you want to go.